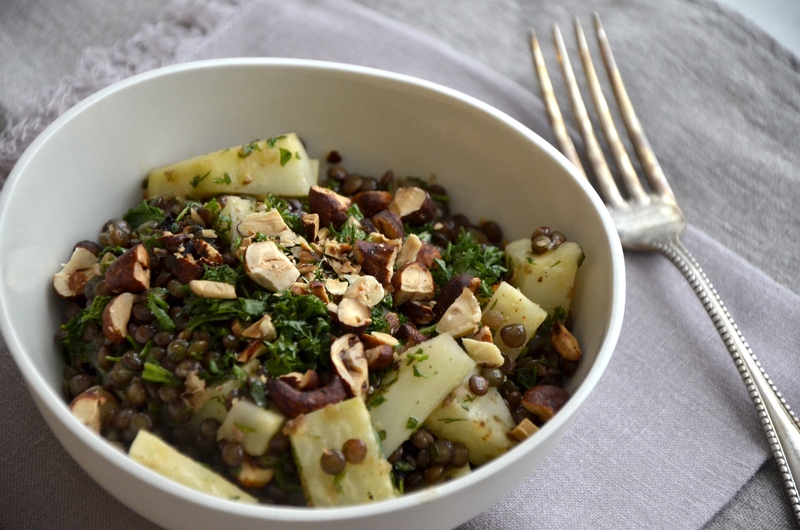 If you cook seasonally, this is a great winter salad for you. You can still find celeriac at the farmers’ market and, anyway, it stores for a long time. Lentils you should have in your pantry; nuts in your freezer. Some fresh mint is a mid-winter luxury to get at the grocery store but well worth it. With these few ingredients you can whip up a fabulously tasty warm winter salad. And you benefit from celeriac’s medicinal properties to boot. Having been around for about 40o0 years, historians note that the “Ancient Egyptians, Greeks and Romans considered celery a gift from the gods and divided celery’s medicinal properties sexually: the strong stalks that grew upward from the ground were judged to be a cure for all masculine dysfunctions, while the root that swelled beneath the earth’s surface was prescribed for female disorders.” Crazy but true. And why not? Preheat the oven to 300 degrees. Scatter the hazelnuts on a small baking sheet and roast in the oven for 15 minutes. Let them cool down, then chop roughly. Combine the lentils, water, bay leaves and thyme in a small saucepan. Bring to a boil, then simmer for 15–20 minutes, or until al dente. Drain in a sieve.